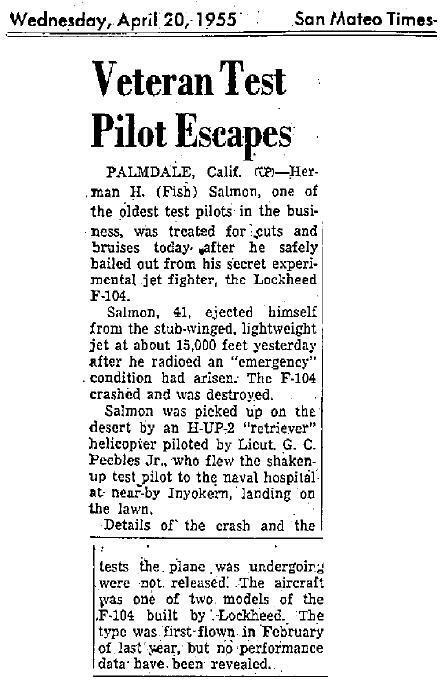 Written off during air-gunnery tests when the gun firing caused impact on the airframe and hatch and pilot Herb 'Fish' Salmon lost control of the aircraft. 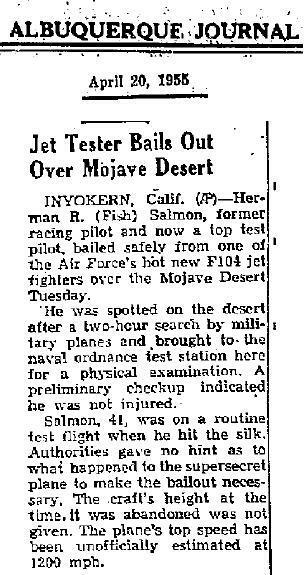 He ejected in time and the XF104 crashed in the Mojave desert. The USAF accident report stated: On 19 April 1955 XF-104 serial number 53-7787 encountered explosive decompression of the cockpit following a gun burst causing the pilot’s partial G-suit to inflate and restrict his ability to maneuver or observe a safe landing site. He was forced to eject (safely). The aircraft was destroyed in the crash 15 miles northeast of Camp Irwin (63 nautical miles east-northeast of Edwards AFB), California. 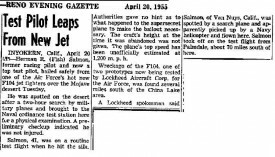 The aircraft was bailed to Lockheed Aircraft Corporation. 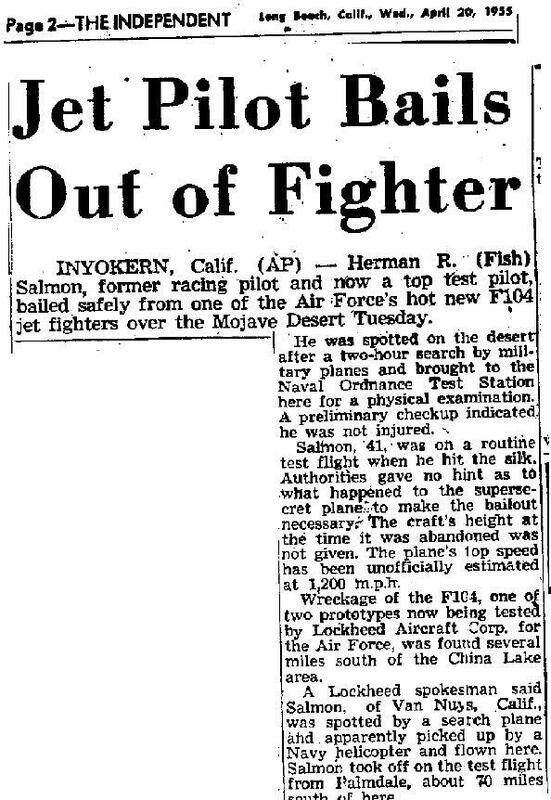 The pilot was Lockheed civilian test pilot Herman R. Salmon. 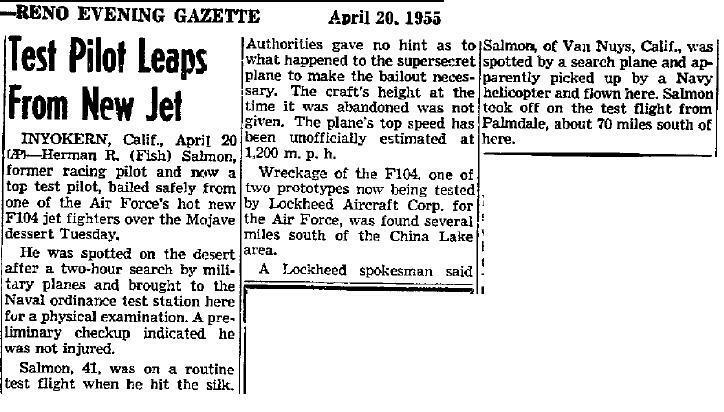 This accident occurred during a high-altitude gun firing test on the Mojave “B” range. Take-off was normal except the aircraft was slightly out of trim and the gear indicators were intermittently indicating unsafe. As the pilot had felt three “klunks” the engineer in charge advised continuation of the flight as the nose gear indicator was unreliable. At 47,000 feet the pilot fired a test burst uneventfully. Then, on the second gun fire burst the pilot’s escape hatch thruster assembly failed. Failure of the thruster assembly caused the hatch to be released. At this moment explosive decompression occurred in the cockpit, along with extreme turbulence and inflation of the T-1 partial pressure suit. The pilot immediately moved throttles to cutoff, extended the dive brakes and initiated a rapid left descending turn to reach a lower altitude. During the descent the pilot’s vision was obscured by fogging of the helmet face plate, also fiberglass insulation and miscellaneous debris in the cockpit making reading of his instruments difficult. He lost mobility when his suit pressurized and had to cinch the K-1 helmet retaining strap tighter to keep the helmet from riding up on his head. He attempted 3 radio transmissions after the second firing none of which were readable due to windblast (though he was able to read transmissions). 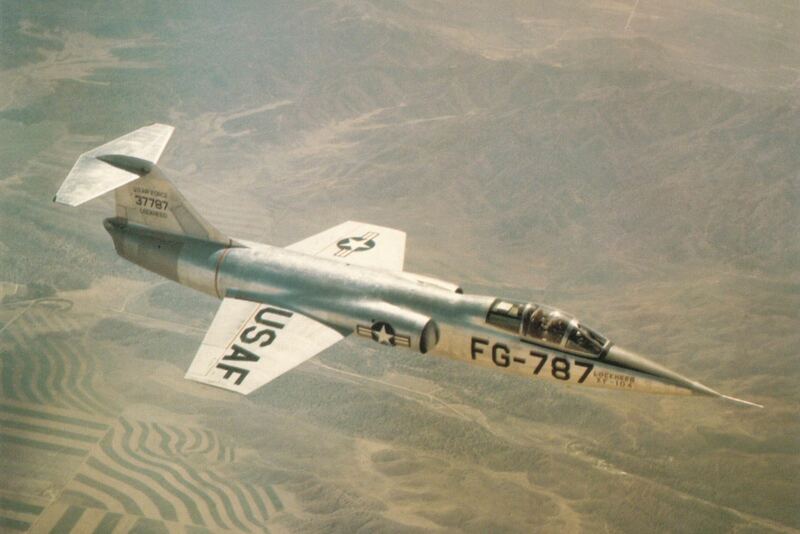 At 15,000 ft the pilot was unable to locate a suitable landing area and chose to abandon the F-104. The pilot ejected safely at 250 knots and was not injured. The pilot was picked up by helicopter 2 hours later. The F-104 struck the ground approximately 2 miles from the pilot and disintegrated. Investigation revealed that the XF-104 escape hatch latching mechanism was inadequate and difficult to install properly. The hatch appeared to have been installed properly, however. Anti-fogging on the K-1 helmet face plate was available to this pilot but he did not use it (pilot did not have the face plate heating element outlet connected). Cause was determined to be the following: The lower escape hatch came off at the time of the gun burst which caused the failure of the thruster assembly. Latch system on the escape hatch was inadequate as to locking.The nose gear lock mechanism on the XF-104 was inadequate. Fogging of the K-1 helmet was a factor, as was inflation of the T-1 suit (though both operated satisfactorily). (the pilot’s head severely struck a rock on landing so the helmet prevented injury). Downward ejection had 3 shortcomings: (1) Inability to grasp the left leg guard due to interference with personal equipment leads. (2) Difficulty in positioning the right ankle clasp. (3) This was a 3-act actuating type ejection. Also, the F1A timer did not actuate parachute opening in this ejection. The IFS owns a copy of the accident report. Beneath next to an official USAF photo of the aircraft also some newspaper articles thanks to Chris Baird.